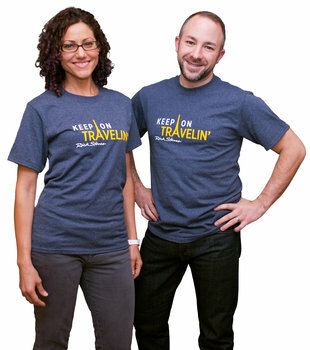 Keep on Travelin'™: Announce your love of travel by wearing (or giving!) 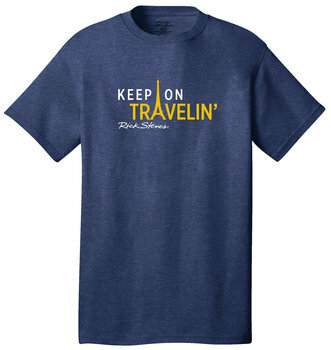 our classy T-shirt featuring Rick Steves' famous TV sign-off line. Built to last: The gold-and-white Eiffel-and-text design is silkscreened (not heat-applied) to a high-quality 50/50 cotton/poly T-shirt. Limited edition: We've only printed up a few of these, so buy yours before they disappear! Cool color: Available in heather navy only, in your choice of sizes.